because the electronic Kindle versions greatly mess up the math. who are teaching out of the book. Please contact me for those. Errata for the book are listed here: errata . SLIDES FROM ISCA 2015 TUTORIAL ON BOOK slides . Given a choice between a single machine with speed s, or n machines each with speed s/n, which should we choose? If both the arrival rate and service rate double, will the mean response time stay the same? Should systems really aim to balance load, or is this a convenient myth? If a scheduling policy favors one set of jobs, does it necessarily hurt some other jobs, or are these "conservation laws" being misinterpreted? Do greedy, shortest-delay, routing strategies make sense in a server farm, or is what's good for the individual disastrous for the system as a whole? How do high job size variability and heavy-tailed workloads affect the choice of a scheduling policy? How should one trade off energy and delay in designing a computer system? If 12 servers are needed to meet delay guarantees when the arrival rate is 9 jobs/sec, will we need 12,000 servers when the arrival rate is 9,000 jobs/sec? 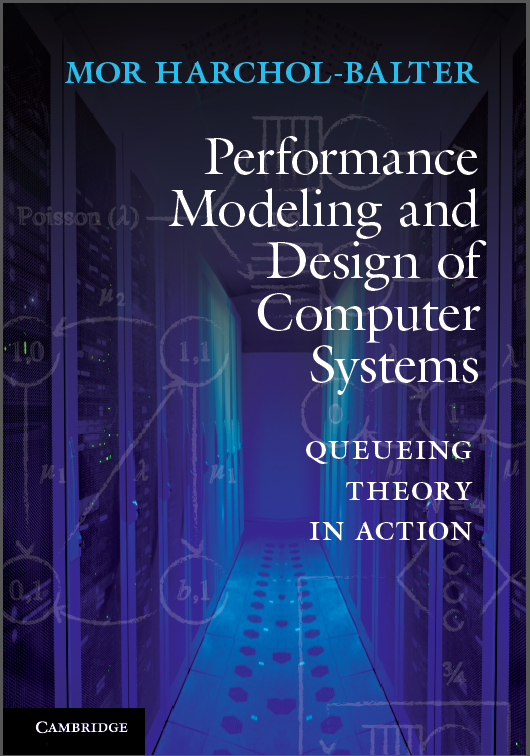 Tackling the questions that systems designers care about, this book brings queueing theory decisively back to computer science. The book is written with computer scientists and engineers in mind and is full of examples from computer systems, as well as manufacturing and operations research. Fun and readable, the book is highly approachable, even for undergraduates, while still being thoroughly rigorous and also covering a much wider span of topics than many queueing books. Readers benefit from a lively mix of motivation and intuition, with illustrations, examples, and more than 300 exercises, all while acquiring the skills needed to model, analyze, and design large-scale systems with good performance and low cost. The exercises are an important feature, teaching research-level counterintuitive lessons in the design of computer systems. The goal is to train readers not only to customize existing analyses but also to invent their own. 1.1 What is Queueing Theory? 15.1 What Does Load Really Mean in an M/M/k? Back to Mor's Home Page .